Fly lines are classified according to their density, i.e. do they float or sink. 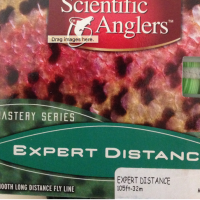 They are rated in reference to the weight of the first 30 yards from #1 – #15, where #1 is the lightest fly line. Good lines to start with when fishing for trout, are #4-#6, and #8-#10 if salt water fishing is desired. 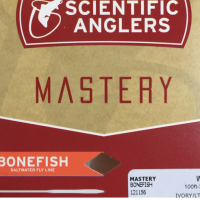 These # numbers give us an idea which lines will suit which rod. Fly lines for one handed rods nowadays are usually around 100 feet (90′ when I started out – they seem to be growing). At the reel end they start with a so called running line, which is thin and glides easily through the rod guides. After a while the running line morphs into an ever-thickening back taper. The back taper can be from short to very long. The length of the back taper will affect the properties of the line (long back tapers are used for distance lines). The back taper will then become the main head section that contains the mass of the line. Then the line gets thinner again, and this part is called the front taper and is thin at the end. The length of the forward taper will also affect the line’s properties. For a delicate turnover of the fly line, a long forward taper is called for. In this fashion, the line is forward heavy (marked FW forward weighted) and it is easy to cast. We cast the line, where most of the mass is in the head section, and our fly follows. At the end of the front taper we place the leader. When a line is cast, the energy in the front taper must bleed into the leader. If a line is cast without a leader, it will kick and will become very hard to control. The goal of the forward cast is to turn over the fly leg and leader and lay out the line and leader straight. When casting a dry fly, it is advantageous to have a long tapered front section, and a long leader for gentle turnover, and delicate presentation of the fly. 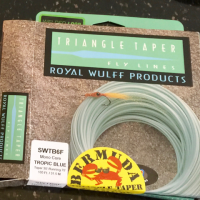 When casting big flies, like streamers and poppers, it is now better to have a shorter front taper which is needed for a more aggressive turnover of the fly leg and leader (now shortened), plus a heavier more wind-resistant fly. The front taper can be anywhere from very long to very short, and its length will affect how it turns over when using different flies. The head length measurement is inclusive of both the tapers. 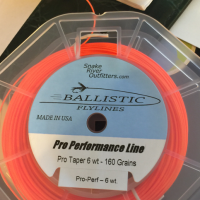 There are lines on the market with very long back tapers (40´), which are used for very long casts and in distance competitions. These lines are not for beginners. When we get better at false casting a longer line (called longer carry), we are carrying the head (say 30´) and let’s say 20´of running line (the carry of a running line is called overhang). It becomes evident that we are loading the rod with more weight (the head plus 20´overhang) than the head (which influences the rod # rating). This is the reason we can cast say a #6 line with a #8 rod, which is called underlining a rod. The lighter line is thinner and has less air resistance than a thicker one. Sinking lines have more density than floating lines, and thus are the thinnest in each #. Line producers play with both the rear taper and the front taper, plus the head weight and mass distribution. The resultant creations can be wonderful for a special situation, and I have lines like that. However, I strongly recommend beginners to start out with a classical floating line, with a 30´head length and symmetric tapers. Lines like that are just wonderful to cast and a beginner’s dream. Manufacturers tend to weigh their lines 1/2 or even a whole # higher than the standard so pay attention to the weight of your line before buying it and compare it to the industrial standard. Some rods have become so stiff (more on that in Rods), that intermediate and even advanced casters can hardly bend them. The # rating on the rod originates from some elite caster testing the rod, and then assigning the rod a # number. It is not an act of Congress nor is it a Papal bull. So, if your rod is better, for YOU, with a heavier line than the ascribed, it is fine. All good rods can cast several # ratings, up or down, so go with the line rating that you like for that rod. It is as simple as that. Lines are made with a woven core, and plastic is added as a coat. They are very strong (30-pound test), and all that strength is in the woven core. They are produced in various colors, from bright to dark. The convention is to make the floating lines bright. There are lines made with a mono core that are stiffer than conventional lines. They are invaluable in the tropical or subtropical heat and are marketed as tropical lines. Conventional lines will become like cooked spaghetti in the summer heat of Florida, where I live. In the so-called Florida winter, they become a bit stiff, so it is back to conventional lines. Then we have some excellent clear fly lines on a mono core.